Hover your cursor over the image below to magnify it. Sorry about the quality of this image, but I only have a very poor photocopy to work with. 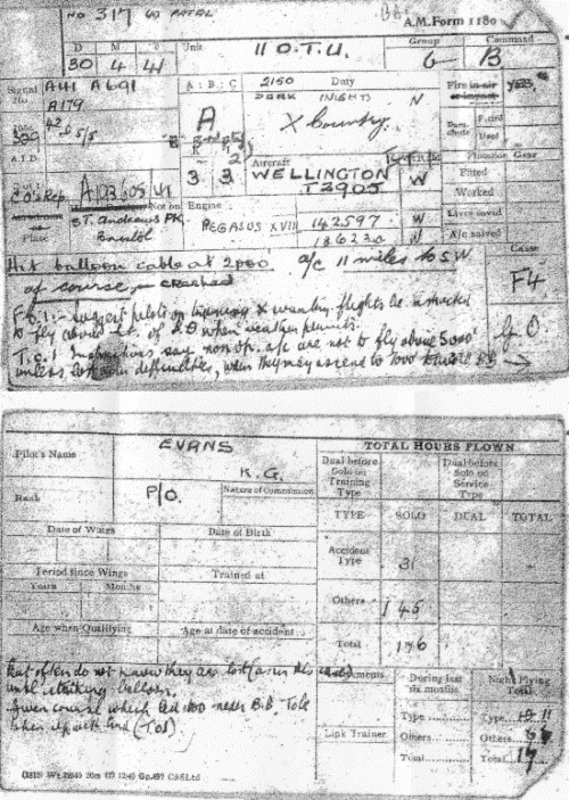 There is a transcript of the notes on the Accident Card below the image. "Hit balloon cable at 2000'. A/C 11 miles to SW.
F.O.I. Suggest pilots on training x country flights be instructed to fly above ht of B.B. when weather permits. T.O.I. Instructions say non op a/c are not to fly above 5000' unless lost or in difficulties, when they may ascend to 7000' to avoid B.B. But often do not know they are lost (as in this case) until striking balloon. Given course which led too near to B.B. Told taken up with cmd. (T.O.I.)"